80 Jahre Glyndebourne – Happy Birthday! Was sind das für wunderbare Erinnerungen – die sprichwörtlich rollende Landschaft der Sussex Downs, die muhenden Kühe auf der anderen Seite von Zaun und Graben beim Pausen-Picknick mit hampers von Fortnam & Mason oder Harrods, dazu die britischen, bizarr-elegant gekleideten Besucher (aus denen die kontinentalen overdressed herausstachen), Pausendrinks mit Pims und Gurkengemüse in Sprite, die eleganten Restaurantpavillons für die betuchten, der bizarre shuttle vom Bahnhof Lewes, dem süßen kleinen verschlafenen Ort, der nur für das Festival aufwacht. Und natürlich die absolut einmaligen sommerlichen Opernabende ebendort. 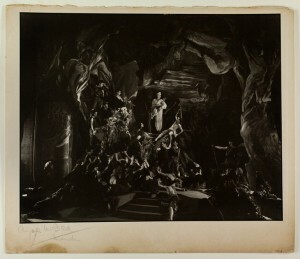 Ich hatte das große Glück, Glyndebourne in seinem späten Glanz zu erleben – nicht mehr die Busch/Ebert-Ära natürlich, aber doch Janet Baker in der Poppea und dem Ulisse (später dann mit Frederica von Stade) von Monteverdi und in Cavallis Ormindo und zwerchfellerschütternd in Calisto sowie dem Orfeo von Gluck als ihrem Bühnenabschied, Kathleen Kuhlmann als betörende Cenerentola, Valerie Masterson in der Entführung, Anthony Rolfe-Johnson in Peter Grimes, ziemlich langweilig Renée Fleming bei ihrem Debüt als Figaro-Contessa, dagegen Felicity Palmer umwerfend in Albert Herring, Bobby Gambills erstem Tristan und vieles mehr. Ich weiß, hier ist nicht der Moment, Kritik zu üben, aber ich denke mit dem neuen Haus verlor Glyndebourne an Identität, und Atmosphäre, wie das oft so ist (Wexford zum Beispiel). Heute scheint es mir (nur mir natürlich) zu international, zu austauschbar, zu wenig Glyndebourne, weswegen ich auch nicht mehr hinfahre. Zumal die Nebenkosten einfach zu gigantisch sind und die Hotels in Lewis, Brighton und London die Preise nicht rechtfertigen. 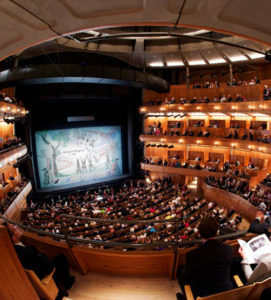 Aber jeder Opernfreund sollte einmal in Glyndebourne gewesen sein, schon der Atmosphäre wegen, immer noch. Und ich erinnere mich an zwei Vorfälle, die mich noch heute lachen machen. Einer passierte während der Figaro-Pause, wo an der Bar Pinguin-gekleidete Herren reichlich Pims tranken und einem die Frackhose runterrutschte um den Blick auf eine feuerrote Boxershort freizugeben. Das Gespräch brach abrupt ab, er zog ungerührt die Hose wieder hoch, und nach dieser Schrecksekunde redeten alle ganz schnell weiter, man hatte einfach nichts gesehen – das ist England. Die andere Eriinnerung betraf die Reise von Victoria nach Lewis, wo ich besorgt den Schaffner beim Einsteigen fragte, ob wir auch pünktlich ankämen: „Don´t worry, the musicians will be on the train!“ Lakonisch und britisch. Im Folgenden gibt es eine Rückschau auf Glyndebourne und seine Geschichte, der website des Festivals mit Dank an die Pressestelle entnommen, ebenso auch die Fotos. Und in English, sorry loves. 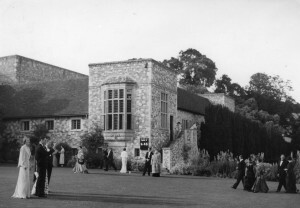 G. H.
The first curtain rose at Glyndebourne in 1934: The curtain rose on the first performance of the Opera Festival at Glyndebourne on 28 May, 1934. It was the culmination of one man’s obsession with the idea of presenting „not the best we can do, but the best that can be done anywhere“. The words are John Christie’s, owner of the estate at Glyndebourne, which he had inherited in 1920. He „felt that it [opera] was almost non existent… in England, so we ought to begin to bring it here“. The term ‘we’ referred to him and his wife Audrey Mildmay, herself a professional singer. They had met at Glyndebourne when John was 48 years old and apparently a confirmed bachelor. 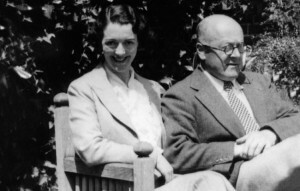 (…) After their honeymoon spent attending Salzburg and Bayreuth Festivals, the Christies returned with John full of plans for an extension to the Organ Room to enable better performances to take place. It was Audrey who realised that the project was neither one thing nor the other, and urged, „If you’re going to spend all that money, John, for God’s sake do the thing properly!“. He immediately took his wife’s advice and set about creating a small purpose-built theatre to hold 300 people, a reasonable orchestra pit and a stage furnished with the most modern technical and lighting equipment. The first season lasted for two weeks, with six performances each of Le nozze di Figaro and Così fan tutte. 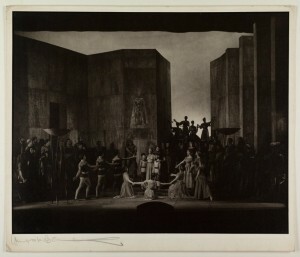 The first performance of Figaro was unlike anything that the audience had experienced before, and whatever their reason for coming, visitors who had certainly arrived in a mood of scepticism returned knowing that they had enjoyed a unique experience. It was not only that they had enjoyed a good dinner during the long interval and a walk in a garden surrounded by beautiful downland scenery; they had witnessed the creation of an entirely new standard of operatic performance. 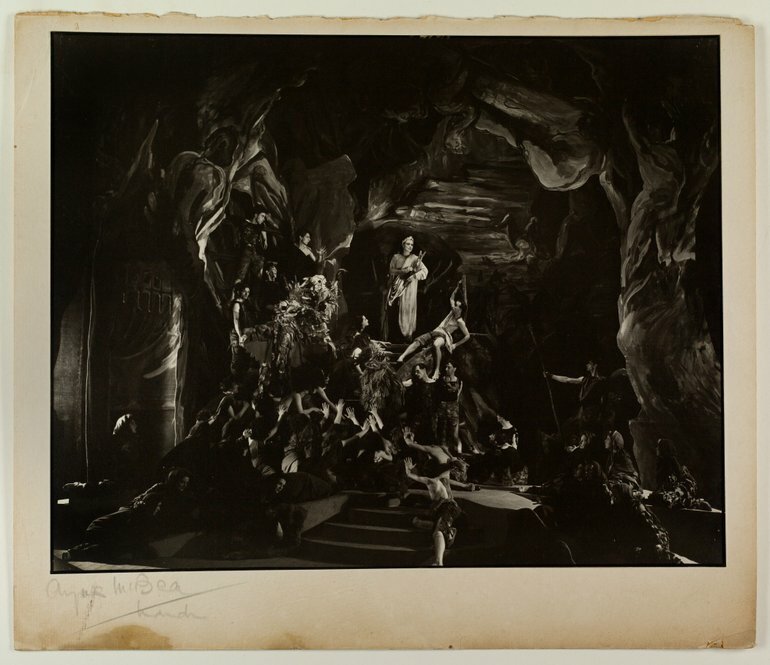 It was a standard achieved by endless rehearsal and by attention to detail – in the orchestra, the singing, the acting, the scenery and costumes. There were no star names among the singers; the secret of the success of the first Glyndebourne performances was the quality of the ensemble, which was built on the principle of choosing the best singers for the parts, no matter where they came from. 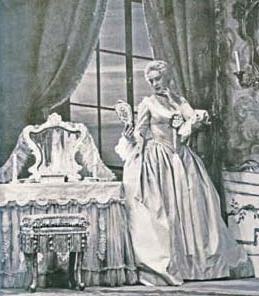 The first season’s company included singers from Germany, Austria, Czechoslovakia, Finland, Italy, America, England, Scotland and Wales. Apart from their vocal talents, the main criterion was simple: the women had to be pretty and the men good-looking! By the time the War came in 1939, a Glyndebourne tradition, style and standard had been firmly established. But it was to be more than 10 years before the Festival Opera returned to normal. Indeed, during the War the house was turned into a huge dormitory for East London evacuee children and babies. 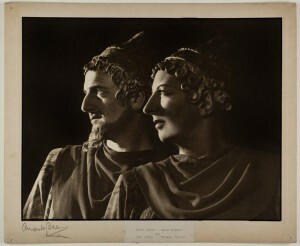 The deaths of Fritz Busch in 1951, Audrey Mildmay in 1953 and John Christie in 1962, as well as the gradual retirement of Carl Ebert between 1959 and 1964, left large gaps in the artistic and personal life of Glyndebourne; but the influence and example of these four figures has not diminished with the years. Passing on the baton: In spite of the loss of its founders, Glyndebourne continued its pursuit of perfection under new leaders. In 1958 George Christie succeeded his father as Chairman of Glyndebourne Productions, a position he held for 41 years. He retired on 31 December 1999, but remains on the Board of Trustees. The family connection remains secure, however, with the appointment of Sir George’s second son, Gus, as Executive Chairman. Carl Ebert’s gradual retirement was felt keenly – he had been in sole charge of almost all productions since 1934. Günther Rennert was appointed his successor in 1960, but he was not to be the sole producer. During this period Franco Enriquez and Peter Ebert were also creating works, joined occasionally by other guest producers such as Franco Zeffirelli and Michael Redgrave. 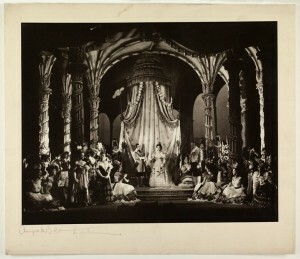 As a result Glyndebourne’s style of opera production began to diversify and the repertoire to expand. 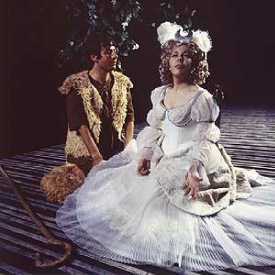 In 1972 John Cox became Director of Productions and produced, amongst others, a striking version of The Rake’s Progress in 1975, with designs by David Hockney. 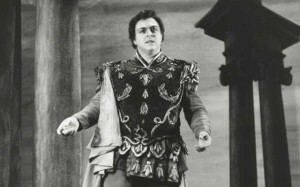 Cox’s successor in 1984 was Peter Hall who had been mounting productions for the company since the 70s in collaboration with the designer John Bury. Their particular successes were initially in the baroque repertoire, but later Hall produced notable Britten and Mozart productions. Guest producers have continued to make appearances regularly and include Jonathon Miller, Frank Corsaro, Nicholas Hytner, Trevor Nunn, Nikolaus Lehnhoff, Deborah Warner and Peter Sellars. The last Director of Productions, Graham Vick, was appointed in 1993, but moved on in 2000. 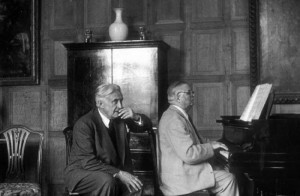 Although Glyndebourne continued without an official Music Director for some years after Busch’s death, the presence of the conductor Vittorio Gui throughout the 50s ensured that high musical standards were maintained. He was also responsible for bringing the works of Rossini into the repertoire. Three years later, when Gui was ready to move on, a promising young member of the music staff was appointed – John Pritchard. He had been an avid admirer and pupil of Fritz Busch, and was himself a gifted Mozart conductor as well as being a champion of contemporary music. Bernard Haitink was Pritchard’s successor in 1978, and 10 years later later, on Haitink’s resignation, Andrew Davis was appointed Music Director – a position he relinquished at the end of the 2000 season. His successor is Vladimir Jurowski. Meeting the demands of audiences and artists: It had become increasingly obvious throughout the 80s, that not only was the old theatre struggling to accommodate the ever more technically demanding productions, it was also struggling to meet the public demand for a limited number of tickets. In 1987 Sir George Christie announced the idea of building a completely new, larger, opera house which would be able to meet these demands. From a shortlist of nine architects, Michael Hopkins and Partners won the contract, and by 1991 the plans were well underway. 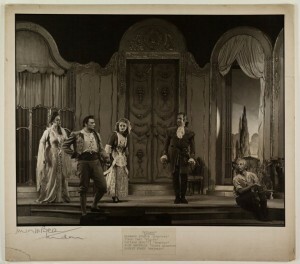 There were many stipulations that had to be met – the new theatre should blend into its surroundings yet be unashamedly a building of its time; it was to have an enlarged auditorium and yet retain its intimacy; the acoustics had to be as good as could be found anywhere; and the facilities for staff, singers and audience needed to be improved. In addition there was a strict time limit, and the budget had to be adhered to. The resulting theatre has won many awards for the quality of the architecture as a whole, and for the craftsmanship of its component parts. It is built from load-bearing, imperial size handmade bricks, the only exception is the fly tower – a steel structure clad in lead, and the most controversial feature of the new building. Acid-washed precast concrete is the other prominent material used in the construction, and this has been used for floors and ceilings. The horseshoe shaped auditorium has been crafted out of century-old pitch pine, fashioned into elegant curves: lit by small lamps it gives off a warm glow. Despite the addition of an extra 400 seats the auditorium has not lost its intimacy, in fact the back wall is six feet closer to the stage than in the old house. Most importantly, the acoustic is vastly improved. The first purpose-built opera house to be constructed in the UK since John Christie had built the original at Glyndebourne, the new theatre opened on 28 May 1994, just as the old theatre had done precisely 60 years earlier, with a performance of Le nozze di Figaro. Further development of the complex has continued, and in 2001 the Jerwood Studio was built, adjoining Glyndebourne’s main stage. Providing a second full-size rehearsal space, it allows singers to experience like-for-like performance conditions. Funded by the Jerwood Foundation, the grant of £1m outstripped any previous single donation in Glyndebourne’s history and was given in recognition of Glyndebourne’s continued dedication to the promotion of young operatic talent. The Touring Company: During 1966 George Christie announced plans to start a touring company, and two years later GTO made its inaugural tour, visiting Newcastle, Liverpool, Manchester, Sheffield and Oxford. 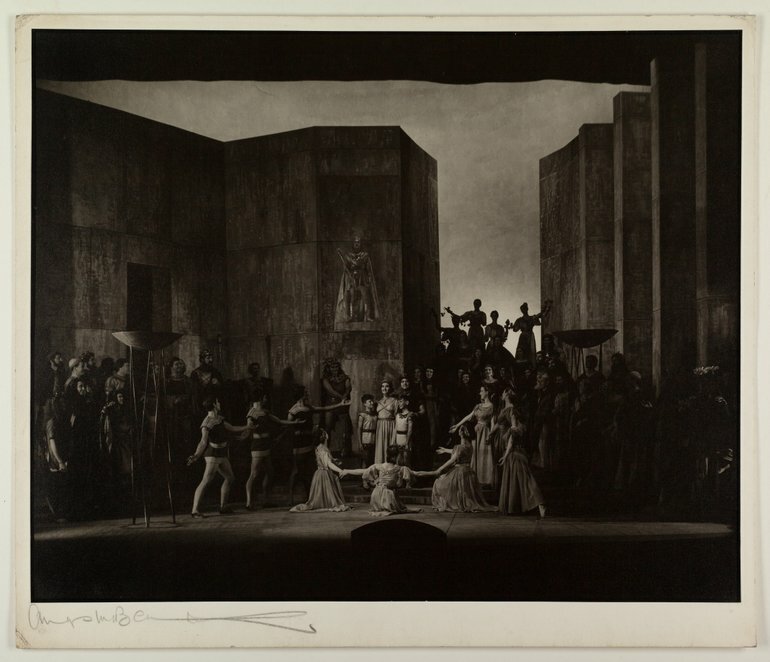 There were only two other touring opera companies at the time and Glyndebourne established its own identity immediately with its innovative productions performed to exceptionally high standards, benefiting as it did from the Festival’s extended rehearsal period. It was greeted by enormous critical acclaim and overwhelming public support which has continued ever since. 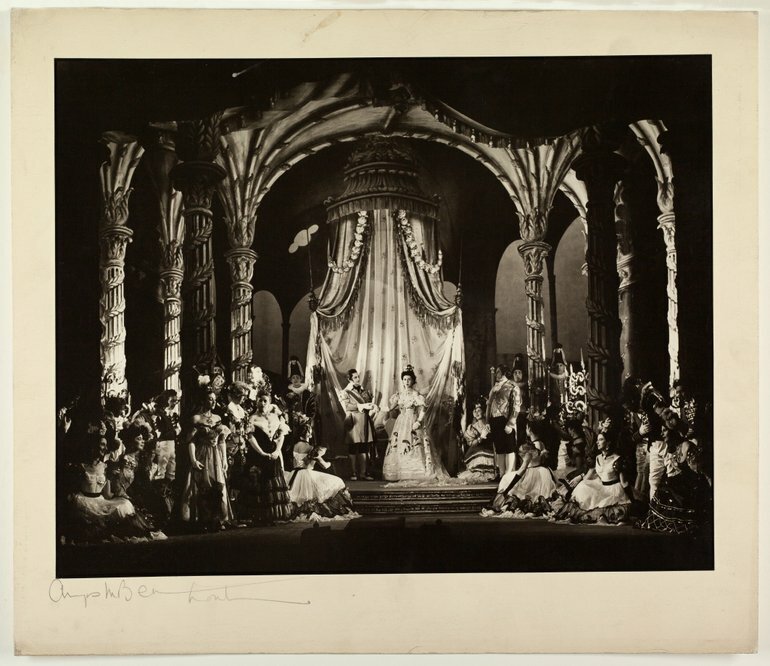 The reasons for its formation were twofold: to make the work of the Glyndebourne Festival accessible to audiences throughout the country, and to give performing opportunities to young and promising singers. From the beginning Glyndebourne has not been interested in names as such, but it has been successful in spotting and nurturing great artists at the beginning of their careers. 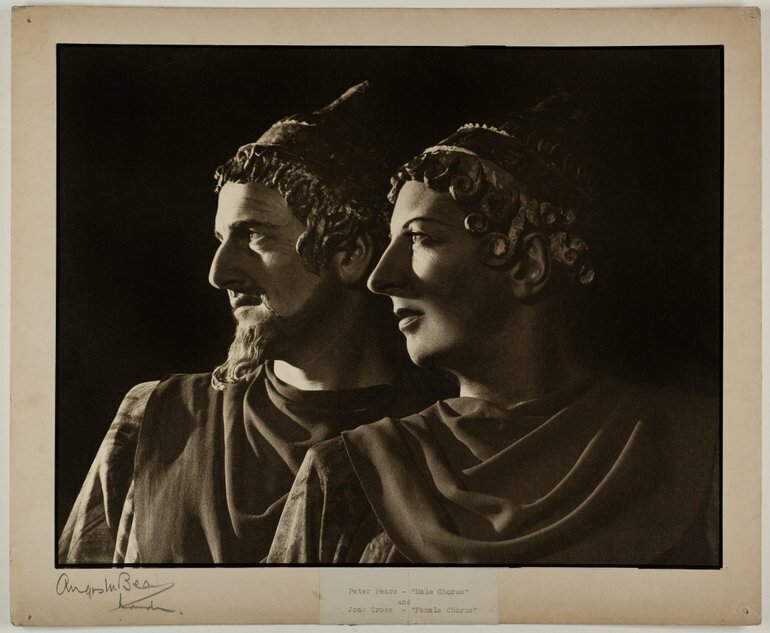 Thomas Allen, Gerald Finlay, Alison Hagley, Philip Langridge, Felicity Lott, Valerie Masterson, Rosalind Plowright, John Rawnsley, Amanda Roocroft, Richard Van Allan, Lillian Watson and Willard White are among the many singers with international careers who began with GTO – now known as Glyndebourne on Tour. Anthony Whitworth-Jones, formerly Administrator of GTO and until August 1998 General Director of Glyndebourne, introduced a policy of presenting contemporary opera and commissioning new works for the future. 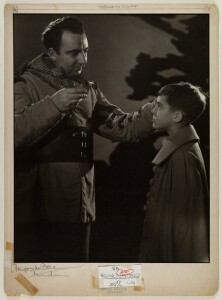 This policy first bore fruit in 1984 with Oliver Knussen’s Where the Wild Things Are and Higglety Pigglety Pop!, followed by Nigel Osborne’s The Electrification of the Soviet Union in 1987, the UK premiere of Sir Michael Tippett’s New Year in 1990, the premieres of Harrison Birtwistle’s The Second Mrs Kong in 1994 and The Last Supper in 2000, and Jonathan Dove’s new opera Flight in 1998. Another of Whitworth-Jones’ initiatives was the establishment in 1986 of an Education Department to complement the activities of GTO. While continuing to play an important part in educating potential opera audiences all around the country, the department has become a strong creative force in its own right, commissioning three community and four youth operas. 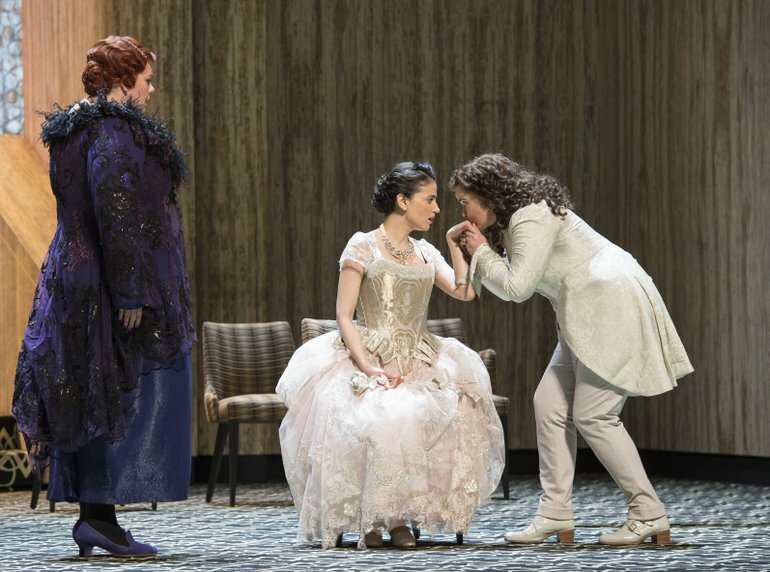 Glyndebourne Festival 2014: „Der Rosenkavalier“ mit Marianne Leitmetzerin (Miranda Keys), Sophie (Teodora Gheorghiu) and Octavian (Tara Erraught). © Bill Cooper. 1994 The Second Mrs Kong (Birtwistle) – World premiere. Commissioned by Glyndebourne. 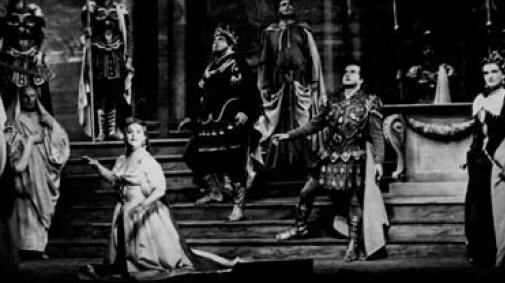 Performed by Glyndebourne Touring Opera; 1995 Ermione (Rossini) – first staging in the UK. ; 1997 Misper (Lunn) – opera for 8 to 12 year olds, commissioned by Glyndebourne Education , and performed by local school children at Glyndebourne; 1998 Flight (Dove) – World premiere. Commissioned by Glyndebourne. Performed by Glyndebourne Touring Opera; 2000 Zoë (Lunn) – youth opera for 13 to 16 year olds, commissioned, organised and run by Glyndebourne Education and performed by young people; 2000 The Last Supper (Birtwistle) – UK premiere. Co-commissioned by Glyndebourne, Deutsche Staatsoper Berlin and Royal Festival Hall. Performed by Glyndebourne on Tour (GTO); 2005 Tangier Tattoo (Lunn) – opera for 18 year olds and upwards, commissioned by Glyndebourne Education Department, and performed by Glyndebourne on Tour (GTO); 2006 School 4 Lovers – a Hip H’Opera version of Cosi fan tutte. Glyndebourne and Finnish National Opera co-production; 2006 Betrothal in a Monastery (Prokofiev) – first professional production in the UK. ; 2008 Love and Other Demons (Eötvos) – World premiere. Co-commissioned by Glyndebourne and Lithuanian National Opera and Ballet Theatre.